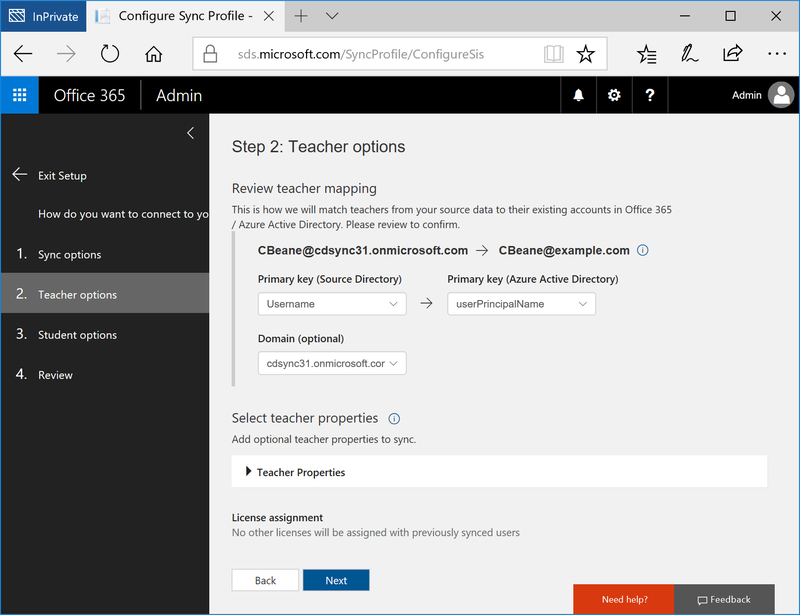 You can use Comma Separated Value (CSV) files with School Data Sync (SDS) to import and synchronize your Student Information System (SIS) data to Office 365. SDS can sync students, teachers, schools, sections, and roster information from your SIS to Azure Active Directory and Office 365. Using this method, you will export or create OneRoster CSV files for School Data Sync from your SIS data, set up a synchronization profile, and upload the CSVs into SDS for processing. Before you can create an SDS sync profile and import your CSV files, you must first convert your OneRoster format CSV files into the SDS format. Follow the steps below to complete this conversion process. Save your OneRoster 1.0 CSV files in your C:\temp directory. Install the School Data Sync toolkit. Create a subfolder called c:\temp\csvs. Create a subfolder called c:\temp\sdslogs. Convert-OneRosterToMicrosoftSDS -onerosterfolderpath "c:\\temp" -sdsfolderpath "c:\\temp\\csvs" -logpath "c:\\temp\\logs"
Go to your c:\temp\csvs directory and verify the new SDS converted files are present. Follow the steps below to import your converted files and create your sync profile. A sync profile is a logical group of options and settings used by SDS to synchronize the CSV data which you plan to upload. 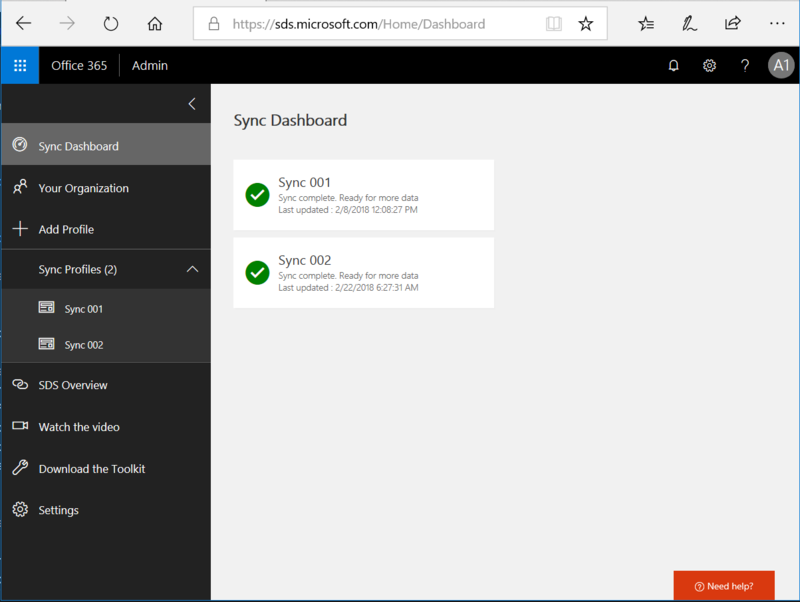 You can create multiple sync profiles within a single Office 365 tenant. 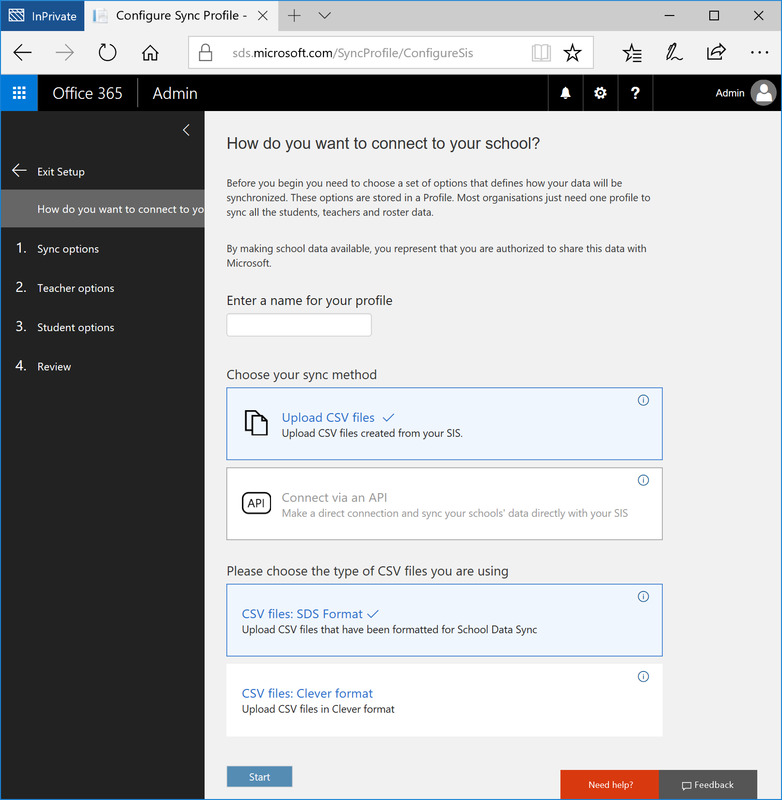 To access the School Data Sync Admin Portal launch a web browser, navigate to sds.microsoft.com, click Sign-In, and then enter your O365 Global Admin account credentials. After logging in, click + Add Profile in the left hand navigation pane to create a Sync Profile. On the Choose Connection Type page complete the form as appropriate. Once complete, click Start. Name this profile - Enter a name for your sync profile. This name will be used to identify the sync profile in the SDS Dashboard, and cannot be changed once the profile setup is complete. Choose your sync method - Choose between the 2 available sync methods shown, CSV or API. If you're syncing using OneRoster CSVs converted to the SDS format, select CSV and then select the option for the SDS Format. On the Sync Options page, select the appropriate option to create new users or sync existing users. Then click upload files to upload your converted OneRoster CSV files. Once uploaded, complete your selections on the page as appropriate. 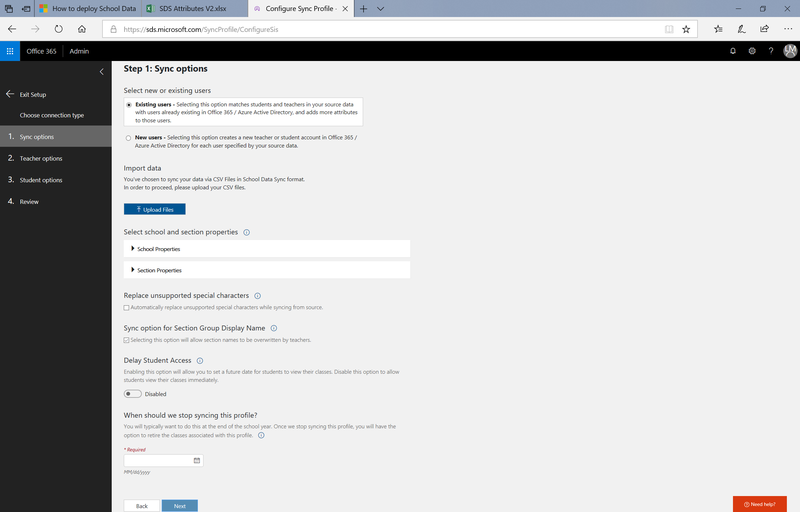 Existing Users - Select this option if you already have user accounts created within your O365 tenant for each of the students and teachers contained within your converted OneRoster CSV files. New Users - Select this option if you want SDS to create user accounts for each of your students and teachers contained within your converted OneRoster CSV files. Upload Files button - Click this button to upload your converted OneRoster CSV files. Upon upload SDS will perform some brief validation tests to ensure the files are formatted correctly. If the validation passes, your files will be uploaded into the sync profile. On the Teacher options page, select the appropriate identity matching options, confirm the teacher properties are selected, then click Next. SDS will check to ensure your selecting attribute and options within the correct format. If matching to a UserPrincipalName for example, you must select a source directory attribute which is in the format of a UserPrincipalName (prefix@domain.com) or you must choose to append a domain to the source directory attribute to ensure the appropriate formatting. If your selections are not in the appropriate format to complete a match, you’ll see a red error displayed on the page. Primary Key (Source Directory) - This is the Teacher attribute in the CSV file used for SDS Identity Matching. Watch the Identity Matching video for additional information on how to select the appropriate source directory attribute, and properly configure the identity matching settings for teacher. Domain (optional) - This is an optional domain value that you can add to the selected Source Directory attribute to complete your Teacher Identity Matching. If you need to match to a UserPrincipalName or Mail attribute, you must have a domain included in the string. Your source attribute must either include the domain already or you can append the appropriate domain to the source attribute using this dropdown menu. Primary Key (Source Directory) - This is the Student attribute in the CSV file used for SDS Identity Matching. Watch the Identity Matching video for additional information on how to select the appropriate source directory attribute, and properly configure the identity matching settings for teacher. On the Review page, ensure you've made the appropriate selections. If no additional changes are needed, click Create Profile. Once you create a sync profile, SDS will begin a pre-sync validation process. During this process, SDS will ensure there are no obvious errors without your CSV files. If any errors are found during the pre-sync validation process, you will have the option to fix them and re-upload files before clicking the resume sync button and begin the real synchronization process. If you receive errors and choose not to update them, you can still choose to resume sync without fixing the errors. Just be aware that SDS can only sustain up to 15,000 errors before the profile will enter a quarantine status. 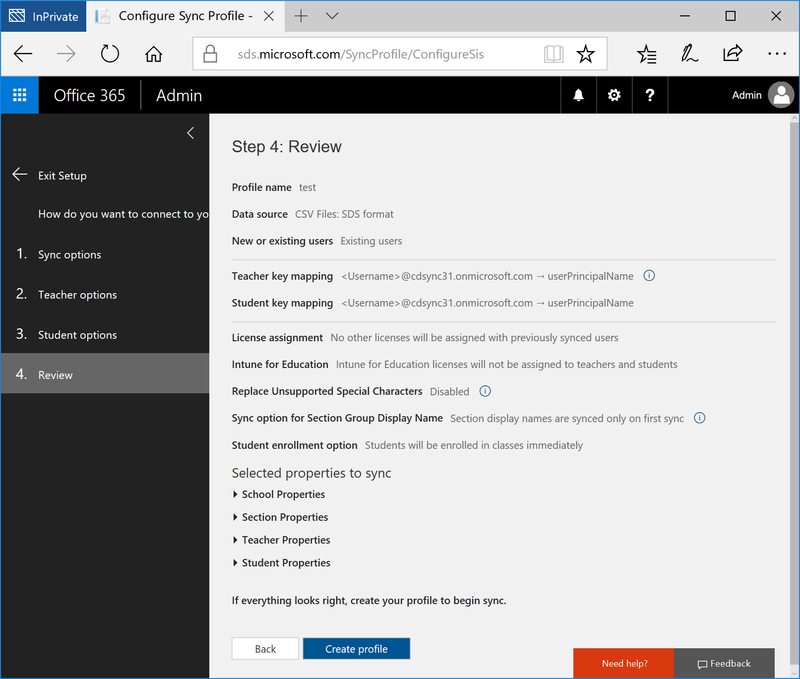 To help automate the sync process after setting up your sync profile, you can install the Microsoft School Data Sync Toolkit. This tool helps you to create an automated sync schedule between OneRoster CSV files and Office 365, and can also be used to verify the CSV file data. For details, see Install the Microsoft School Data Sync Toolkit.